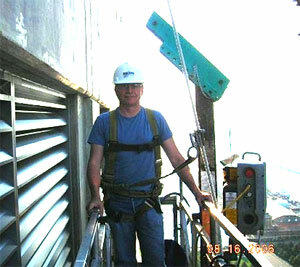 Mark Meshulam is an expert witness and consultant for window sealant failures. 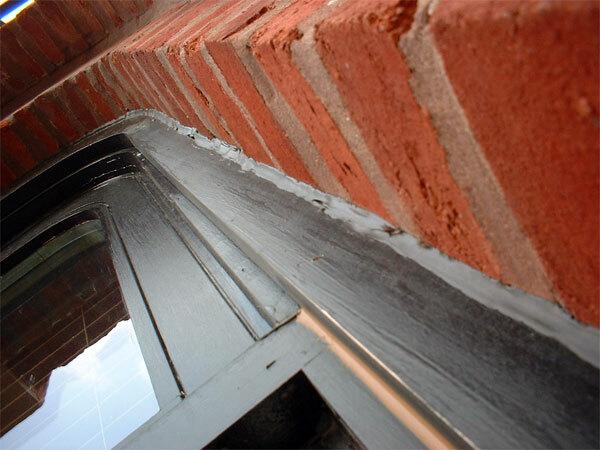 Since sealant (caulk) is usually the primary means of sealing elements of a window system together and to the surrounding condition, sealant failures are often part of a window leakage problem. To the uninitiated, sealant is gooey stuff you buy in a tube at Home Depot and smear on cracks. To window-ologists, however, sealant is a science. Windows must be caulked to the surrounding conditions or they will surely leak. I did see a job once where an inventive contractor tried to use the EIFS coating of the exterior wall overlapped onto the edge of the window, instead of using caulk. Of course this brittle material cracked at the first thermal movement. Water leaks in this building filled 5 gallon buckets and the wall became the worst mold colony I ever saw. Lesson: use caulk around your windows, not creativity. In this type of sealant failure, old caulk or a “bad batch” of caulk never fully cures. It might have a gummy quality, or turn into a disgusting liquid. This is a bad problem and will require removal and cleaning or full encapsulation to rectify it. This sealant failure is characterized by having released from one or both substrates. This is called sealant adhesive failure. 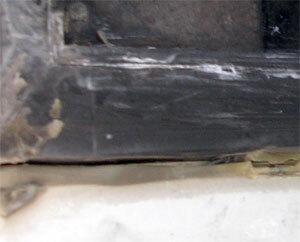 Adhesive sealant failure occurs when the sealant does not stick to one or both substrates. Ironically, the adhesive bond can release days, weeks or even months after application. It probably will not be known during application. The best way to prevent this type of sealant failure is to perform adhesion tests on substrates before performing all of the caulk work. Perform the tests with and without the recommended primers. This will flesh out potential adhesive incompatibilities. Equally important is the use of proper cleaning techniques immediately prior to sealant application. And always “tool” the joints! Carefully follow manufacturer’s instructions and recommendations for cleaning methods and follow them religiously. Cohesive sealant failure occurs when the caulk shows a rupture or tear within its boundaries as opposed to where it sticks to something else. 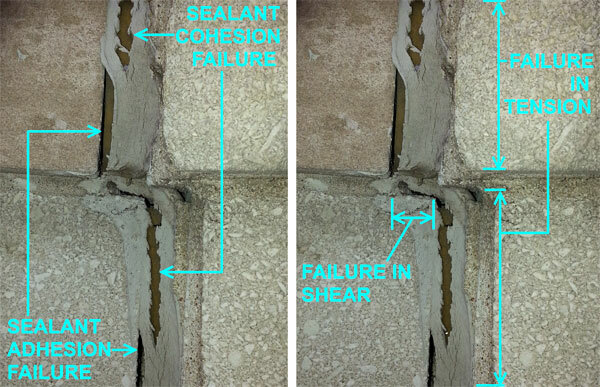 Cohesive sealant failure can occur as a result of sealant deterioration or poor joint design. Caulk joints must be installed according to manufacturer-approved designs in order to function well. Generally, the design will include the use of a foam backer rod, creation of an hourglass shaped sealant cross section, a specified ratio of width to thickness, a minimum amount of area of adhesion at each substrate, and “tooling” of the joints. Everything you wanted to know about sealant failure, both adhesive and cohesive, in shear and tension, in one richly illustrated graphic. How do we do it? Sealant is only as good as the person who installs it, and the substrate that si being sealed. If the caulker misses a spot, even a small one, the building will leak and possibly quite a bit. 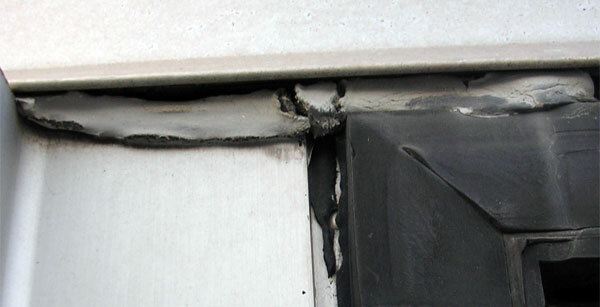 Sometimes the window, flashing, or adjacent wall has overlaps or cracks which penetrate the caulk joint. These cracks or overlaps will conduct water into the building even with a world-class caulker on the job. Unless your building is caulked with aquarium sealer, I would be willing to bet that your warranty will be void, and sealant failure will occur prematurely, if the caulk is subjected to immersion in water. The most classic example of this is at “back-pitched” sills or balconies. If you see your sealant joints immersed in puddles of water, find a way to either correct the pitch (slope) of the sill, or create a drainage path which will carry water away from the caulk. Caulk utilizes fairly complex chemistry which includes the actual solids involved, the solvents, the cure chemistry, the crosslinking of molecules as cure takes place, the release of by-products of cure, the development of adhesion. If the caulk is in the presence of other materials which also have a reactive nature (as opposed to being inert), you might find that these two materials will react to one another, possibly not in a good way. They might degrade one another, or fail to adhere to one another, or prevent the cure of one or both materials. Or, they might simply discolor one another while continuing to otherwise perform. Take sealant compatibility very seriously and test all substrates with the caulk you want to use. Also be sure to use the cleaning solvent which is compatible with the sealant. Do not improvise with your solvent selection. If the instructions say to use isopropyl alcohol (IPA) for example, don’t use denatured alcohol, grain alcohol or vodka. Use what the manufacturer specifies. The wrong solvent can be incompatible with and cause seal failure. If you have a project which involves either failures involving sealant, or a project which will utilize a significant amount of sealant, make sure you are doing it right. A good sealant job will last 20 years or more. A bad job can fail during the next rainfall. It does not cost much more to do a good job. Involve an expert (call me, for instance) to ensure that your sealant performs and gives you the value and water-tightness you bought. And if you just need a great caulker, let me know. Another view of stress waves emanating from the nickel sulfide inclusion. The stress waves are in the shape of four teardrops pointing to one another, converging at the nickel sulfide inclusion. The small teardrops aim toward the glass surface, where the localized stress was quickly relieved as the fracture made its way to the surface. The taller teardrops stretched their way along the length of the fracture.